How about a free Nook Simple Touch? Or a Nook Color at half-price? Or even $50 off the new Nook Tablet? As of today, Barnes & Noble (B&N) is offering such deals. However. there is a bit of a catch. The Nook Simple Touch is free with the purchase of a one-year subscription to the New York Times. The Simple Touch is B&N’s new e-reader (released last summer). It normally sells for $99, and has received generally positive reviews. A subscription to the New York Times costs $19.99 per month, which will be billed to your credit card, according to Barnes & Noble. There is an early termination fee of $99. The Nook Color is B&N’s color e-reader. It’s normally $199, but will be basically half off at $99… with a subscription to the New York Times. Same conditions as above. The deal on the Nook Tablet is a bit different. 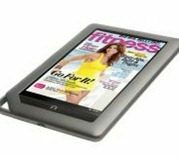 It’s $50 off, making the tablet $199 (same price as the Amazon Kindle Fire) with the purchase of a year-long subscription to People Magazine. A People Magazine subscription runs $9.99 per month. Barnes & Noble states that the offers are good until March 9, 2012, and are available at their stores, website, or at the Times’ exhibit booth at the Consumer Electronics Show (CES) in Las Vegas this week.